Before leaving Turkey after Annabelle’s birth, we decided that we really should take a small side-trip to see a little more of the country than just Istanbul. 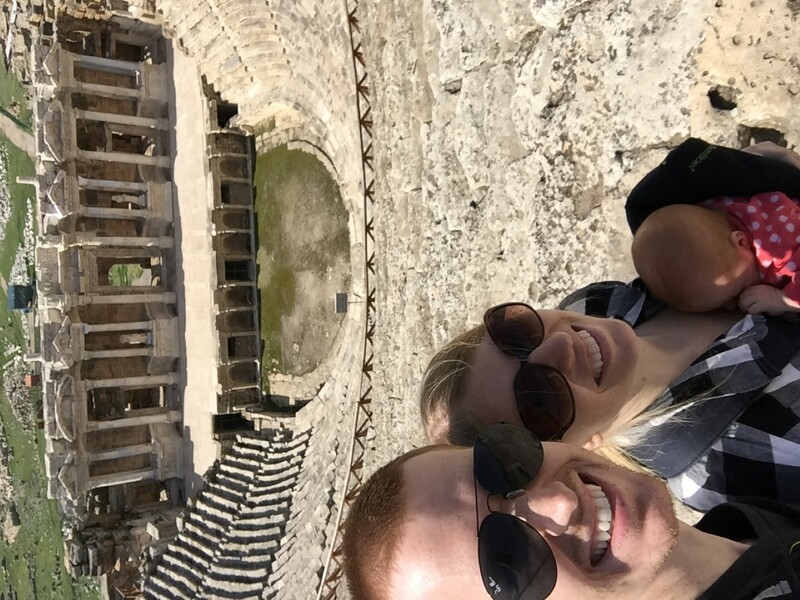 As amazing as that city is, there were plenty of places to visit, and though our side-trip opportunities for exploring Turkey were limited with a newborn, we couldn’t head off without seeing at least one other cool place. We’d heard great things about Cappadocia, and considered going there for a few days, but the big draw for the city (and an item on our bucket list) is the hot air balloon experience. Floating over the ancient dwellings there is supposed to be magical. Hot air balloons are a big no-no for newborns, apparently, so that was out. But where else could we go? A short flight from Istanbul near the city of Denizli, Pamukkale is the home of natural hot springs that, over time, covered the mountain they originate from in white calcium deposits. That’s not snow, it’s calcium deposits! The Romans saw this and said, “Wow, this place is super cool. It must have magical healing properties. Let’s build a city here, guys!” (I wasn’t there, obviously, but that’s probably what they said, right before high-fiving each other. I totally get Ancient Roman culture). 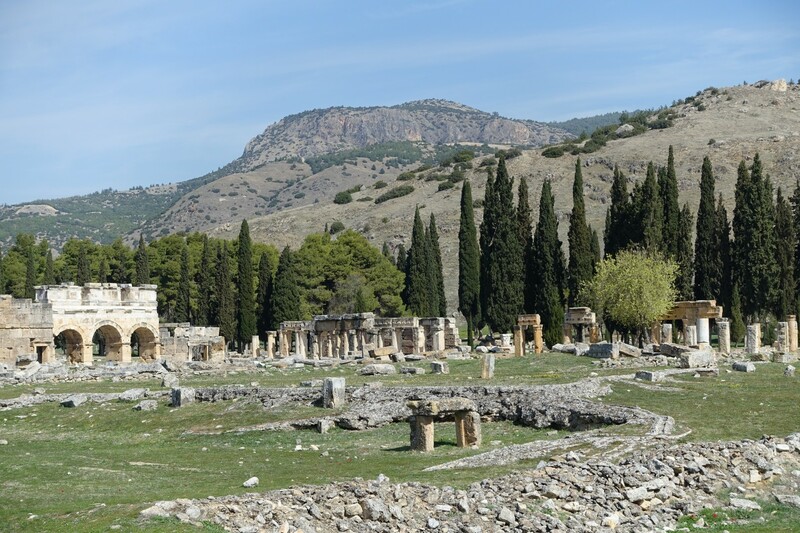 So at the top of the mountain sits the ruins of a Greco-Roman city named Hierapolis. This place is crazy-beautiful and a complete surprise to us. Why didn’t we know there were full-on Roman cities so far away from Rome? I said I understand Ancient Roman culture, not history or geography. Beautiful pool on the walk up to Pamukkale. Anyway, we headed up the mountain, holding our shoes per their rules so as not to dirty the calcium deposits we walked on, occasionally stepping through pools of water as we went, until we reached the ruins at the top. Not that we climbed around like a bunch of monkeys, but Annabelle did get fed and changed on a few different choice pieces of Roman architecture. 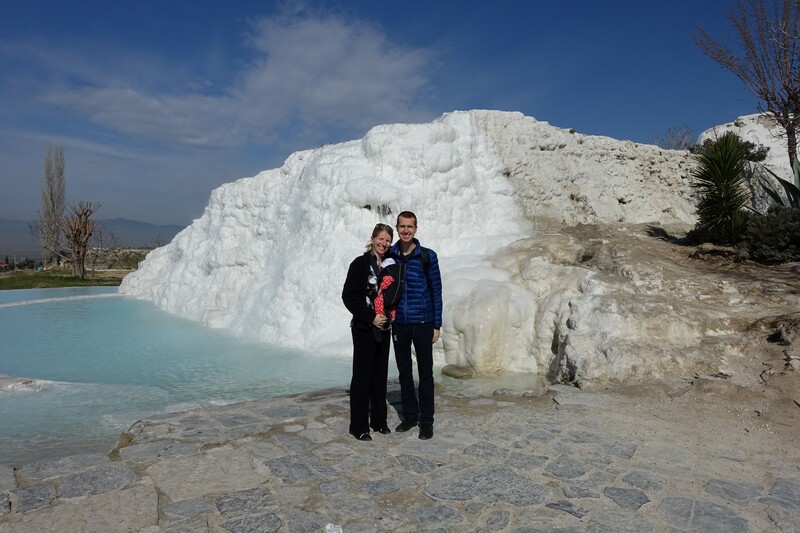 Our visit to Pamukkale was short, but we were so glad we took the chance to visit this city that was more off-the-beaten-path. Ancient Roman amphitheater in Hierapolis.